Mix all ingredients well together and distribute the mixture over 4 gratin dishes. Bake the crab 25 minutes in the oven at 180 degrees Celsius. Stir fry the leek a few minutes in a little oil. 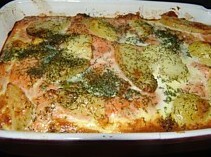 Distribute one third of the potatoes in a layer in a greased oven dish. Add one half of the leek and one half of the salmon. Repeat the process, finish with a layer of potatoes. Mix the cream with the eggs and pepper and salt to taste and pour this over the potatoes. Sprinkle with dill. Bake the lax pudding half an hour at 170 degrees Celsius.